President Michael D. Higgins at his inauguration on Friday, with former presidents Mary Robinson and Mary McAleese in the background. Like me, half the country here stopped what they were doing last Friday to turn on the TV and watch the inauguration of our new president. The first thought that struck me looking at the high and mighty assembled for the ceremony in the splendor of Dublin Castle was that they all had one thing in common. Can you guess what it is? The elite group present included retired presidents, former Taoisigh prime ministers), ministers, senior politicians, attorneys general, and the holders, or former holders, of many other important state positions. It was a mixed group from the top layer of officialdom, which crossed all parties and all the offices of state, including the civil service, the diplomatic service, the judiciary, the army, various government bodies and so on. There were perhaps 200 or 300 people at this exclusive ceremony inside Dublin Castle at which Michael D. Higgins was sworn in as the ninth president of Ireland. And as I said, they all had one thing in common. With the exception of a few of those present, like the church leaders and the Higgins family, every one of them was either already on, or in line for, a big fat state pension. We're not talking chicken feed here. At a time when pensions across the private sector here have been decimated by the financial crash, these guys (and gals) are getting pensions that are enormous by any standards. We're talking up to €100,000 a year, or even a lot more. And it's not just the level of these five star pensions that is so valuable. Even more valuable is the fact that they are guaranteed. For life. They are unaffected by the collapse of the stock markets. Why? Because these pensions are not funded by investments in the markets, which can go up or down (or even way down, as we now know). No, these pensions are paid out of current state revenue from either taxation or borrowing. So they are insulated from anything as vulgar and uncertain as the markets. They don't depend on whether a pension fund has gone up or down in value. That kind of thing, as Leona Helmsley once said, is for the little people, the ordinary Joes who work in the private sector. The state sector elite and their huge pensions are above all that. Now you might think that I'm being inappropriate and small minded here. That I should not be discussing this in the same context as the inauguration of our new president. But it is the other word beginning with P -- pensions -- that everyone here was talking about last week as more information about the scandalous level of state pensions made the news. This is the one issue that enrages people here in the private sector more than anything else. Because of the stock market crash, close to 80% of all private sector defined benefit pension schemes here are now in deficit. Many of them have huge black holes in their funding and are virtually bust. Defined benefit schemes are the ones run by most of the big companies here, which supposedly guaranteed you a defined pension, usually between half and two thirds of your pay level. Both you and your employer paid into the fund over the years and to get the full pension you had to be paying in for 40 years. As I mentioned above, nearly all of these pension funds now can't meet their obligations because the money they invested in property, the stock markets, bank shares and so on has collapsed in value. There are tens of thousands of people across Ireland (like this writer) who are affected by this. In fact, my own case is typical. I've spent a lifetime in the newspaper business, paying the required amount into my pension fund over the years. Now the deficit in the pension fund of my employer, the biggest newspaper group in Ireland, is so huge that there is a question mark over the ability to pay my pension into the future. There are rumors circulating that the scheme could be drastically curtailed or even wound up altogether. And it's not just in the newspaper industry; the pension funds in so many of the biggest companies in Ireland are in such trouble that the government set up an expert group to advise on what can be done, with the report due by the end of the year. Everyone knows what the outcome is going to be -- private pensions are going to be cut heavily, perhaps in half, to stop these pension schemes going bust altogether. So in the case of a typical middle income earner, like a journalist, an expected pension of €40,000 may end up being €20,000. And that's after a lifetime's work and a lifetime paying into the scheme. Contrast this with our state sector elite, whose pensions are enormous and guaranteed for life. Figures released last week showed that this year around 100 former government ministers got €8.8 million between them in pension payments, or close to an average of €90,000 each. And it's not just ministers. There are many other people who held senior positions in the civil service and other state organizations who are also in the pension golden circle. This is the same elite who were in the hall in Dublin Castle last Friday and got all misty-eyed as Higgins went through the more emotive passages of his inauguration speech dealing with the plight of people trying to survive in today's recession-devastated Ireland. He did not specifically say so, but one presumes he was including all those older people in the private sector whose pension funds have been decimated (or even wiped out altogether if they invested all their retirement savings in bank shares). Our new president is well known for his emotive speech-making, and his inauguration address was replete with ethereal meandering about needing to get away from the narrow greed of the boom years and back to an earlier time when the dignity of people was valued. We need to shift to a new paradigm, he said, we need a new aisling (national dream). Our creativity and innate goodness as a people will save us, as long as we get back to being a community and abandon individual greed. And so on. It was stirring stuff. And the elite in Dublin Castle listening to him applauded warmly. It was a special moment . . . especially if you had the security of a big fat state pension to allow you to wallow in the emotion for a few seconds. 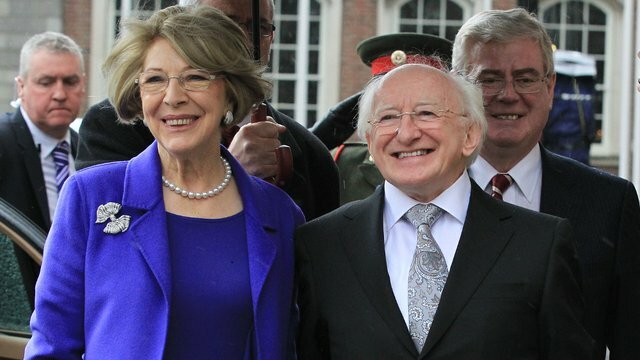 One can't blame Higgins for this situation (although as we pointed out here last week, as a teacher and politician he has been cosseted by the state all his working life and his pay and eventual pension as a president make Barack Obama look like a pauper). It's the system we have here. The state elite look after themselves very nicely, and no one challenges the status quo. But people in the private sector here are now waking up to the scandal of these state pensions and are asking how this situation can continue when their pensions are facing collapse. One of the most annoying aspects of state pensions for politicians is that they are cumulative. They get so much for years as a member of the Dail (Parliament) and so much for being a minister, etc. And they don't have to wait until they are 65; they get the pension straight away when they leave the Dail. This is how our former Taoiseach Brian Cowen -- the man who signed the bank guarantee which lost our economic sovereignty to the IMF -- is now retired at the age of 51 on a pension of over €150,000 a year, for life! His predecessor Bertie Ahern, who oversaw the boom and bust in our economy, gets even more, at €152,000 a year. Do a web search and you will get the details of the astonishing number of our former politicians, civil servants, judges and so on, all of whom are on huge pensions for life. And the politicians and others in the state elite keep getting their pensions even when they take on other jobs and get big salaries, like the former Taoiseach John Bruton, who became EU ambassador to the U.S. after he "retired" and is now head of the International Financial Services Center in Dublin. Even that embodiment of virtue Mary Robinson has been getting around €180,000 a year in a pension (for her years as a senator and then as president) -- and that's before we add in whatever she gets from the UN for her time there and whatever else she gets. She's been getting her pension from here since 1997 when she left the presidency, it goes on for life and she's still only 67! One of the really nauseating examples of this greed is the attorneys general here, all of whom are top lawyers and go back to their lucrative careers (€3,000 or €4,000 a day) after their average three or four years in office as the government's legal advisor. Eight of these guys signed a public statement recently which derailed the government's attempt in the recent referendum to replace our expensive tribunal system (a gold mine for lawyers) with cheap parliamentary inquiry committees. They are all on pensions of around €50,000 a year for their three years or so of state service, even though some of them have earned millions before and since then (they include a head of Goldman Sachs, a head of the biggest bank in Ireland and an EU Commissioner). They're all millionaires but as far as I know they're all taking their €50 grand a year! Most of the state elite also get big lump sum "packages" when they retire, as well as their pensions. They start getting their pensions immediately no matter what age they are and they go on getting the money no matter how much they earn if they go back to work. Worst of all is the current example of the retiring head of the Department of Finance here, a case so grotesque that we will devote a full column to it next week. Of course it's not just the elite in the state sector who benefit from this system. All state-paid workers like civil servants, soldiers, police, teachers, nurses, and so on get guaranteed pensions of around two thirds their pay level. Their pensions are guaranteed for life. They may not be huge, but they are still likely to be double what similar middle-income workers in the private sector will be getting from their devastated private pension funds. How can this be justified? Higgins -- whose inauguration speech was an appeal to the country to get back to caring and sharing and the old Irish values -- needs to do some soul searching on all of this if he is to lead the Irish people into a new era of fairness and equality, as he wishes. So his pay will be just €250,000 a year. But then the president of that tiny country called Germany gets only €213,000. Higgins’s pension will be half of his salary ... and of course he will have his ministerial pension and his Dail pension to add to that, and maybe a pension from Galway University where he used to teach as well. He could end up with more pension money than Brian Cowen or even Bertie Ahern! And it all comes out of state funds! To summarize all this, there is a lot of talk about fairness here and there was a lot of emotional stuff about it in our new president's inauguration speech. But the political elite in Irish society are far better at talking about a fair society than doing anything about it. If they are serious, they should immediately cap all state pensions at around €30,000 a year, which is more than many middle income private sector people here are now ending up with after paying into their private pension funds all their working lives.